Local runners, walkers and cyclists are probably already familiar with the B&O Trail. It&apos;s a scenic and safe place to get outside and get active. 2017 has brought expansions to the trail making it better than before with even more improvements on the horizon. The biggest news regarding the trail is that a new expansion is now open west of Ind. 267 next to the Frazee Gardens in Brownsburg. The newest section of the old railway turned rail trail crosses over White Lick Creek and continues west to County Road 500 East. The new expansion passes through gorgeous natural scenery, and users of the trail will love exploring this new route. The new extension also brings a slight change for motorists on Ind. 267. A new light has been installed at that intersection to stop vehicles and let hikers and bikers cross the road. My children and I ventured out to see the new expansion, and although the day was chilly, we had a great time exploring and observing all that the trail had to offer. The kids loved seeing squirrels scamper around, and I loved the little taste of the woods that I could enjoy right in the heart of Brownsburg. Because no motorized vehicles are allowed on the trail, I could let my children run and play without worrying about their safety. When the weather warms up, I look forward to including the B&O Trail in my rotation of running spots! 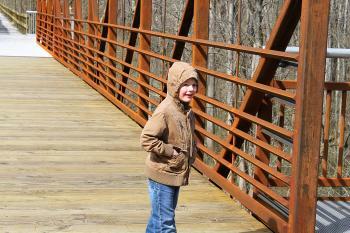 The highlight of our trip was checking out the new bridge at White Lick Creek. The bridge itself is beautiful, and the view from the bridge is even better. 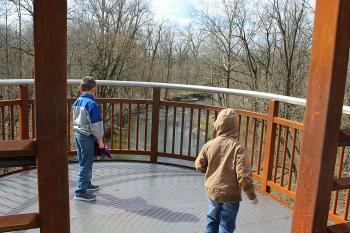 The new bridge includes gorgeous observation decks, where you can step off the main trail and enjoy the scenery. It&apos;s also a great place for fishermen to stop and try their luck! By the summer of 2017, construction should also be finished on the gap in the trail from Ronald Reagan Parkway to County Road 300 North, creating one continuous paved trail from Brownsburg all the way to Raceway Road. This summer also brings the 25th anniversary of the B&O Bicycle Tour. On June 3, riders on all four of the routes will get to enjoy the expanded trail and live music and food after! Whether you&apos;re a resident or a visitor, if you enjoy being active, the B&O Trail is the place to be. It&apos;s perfect for a family walk, a bike ride or an outdoor run. For more ideas on ways to get active in Hendricks County, be sure to check out some of these great locations.